Cottonwoods Hoping for Drier Times in Vermont? As I look out my window on this sunny afternoon I see cottonwood seeds swirling in the wind, probably blowing up from the trees along the nearby river. Highlighted in the bright sun, they almost look like light snow. The eastern cottonwood trees know what they are doing. Their tiny seeds can only germinate in wet areas of bare soil, usually consisting of mud or sand banks left by receding rivers after floods. As Vermont slowly dries out (hopefully for the summer), the smaller rivers are dropping, and the larger rivers will soon as well. The Middlebury River, for instance, has dropped several inches today, exposing new places for cottonwood seeds to germinate. While I was dipping my feet in the cold river, I noticed several fluffy seeds blowing into the water, perhaps to be deposited in a suitable site for germination. The forecast looks promising for cottonwoods, farmers, and people recovering from the recent floods. Tomorrow there may be a line of thunderstorms with brief heavy rain and strong winds, but it is expected to be a fast-moving storm. After it passes, no more rain is forecast for the rest of the week. I don't know if the cottonwoods actually release more seeds after flooding, or if they have just adapted to time their seed release to a time of year when water levels typically drop. Either way, this year will probably be a good one for cottonwoods. These trees are very well adapted to cyclical floods, and a larger than average number of cottonwood seedlings will probably survive this year, since there is lots of new habitat for them to colonize. I've posted some pictures below from the latest series of storms that came through on Memorial Day Weekend. I experienced much of this storm, as I left Burlington as it was arriving, stayed ahead of it until Bristol, hit torrential rain south of Bristol, and popped out into sun in East Middlebury (where the storms had not arrived yet). 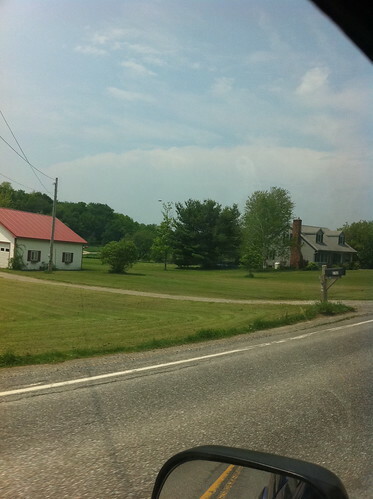 The picture below is of one of the first severe storms to enter Vermont. There are more pictures after the 'see more' link below. This was a possibly-rotating severe storm crossing Lake Champlain as seen from Hinesberg. Unnoticed Urban Nature: Urban Hydrology of Burlington, Vermont. Urban nature, long unnoticed by almost everyone, is getting some much deserved attention as of the last year or two. Most of the attention paid to urban nature is to animals and plants that have adapted to urban conditions. Another element of urban nature, one that is still not gaining much attention, is that of urban hydrology. Water flows downhill. As a 'complex system', water flow is an example of something with very simple rules that result in very complex phenomena. As it flows through urban environments, some very unexpected things can happen. Since water flow is scalable (the smallest trickle acts in a similar way to the largest river), very neat little worlds can be found in areas of water flow in the city. I've created a Google Map of urban hydrology I've noticed in Burlington, Vermont. Inspired by my Junction Hollow Historic Channels map of part of Pittsburgh, and an LA Creek Freak "Where's My Creek" map, this map illustrates some features I've found. If anyone expresses interest in this, I will probably add more later. Meanwhile, go ahead and explore the map... click above, or click below for an in-blog map window. Sorry for the lack of updates lately. I've been bust finishing up grad school and yesterday I officially graduated from the UVM Field Naturalist program. It's been an amazing, very busy two years. I'm not totally sure what is up next but in the shorter term... Expect more posts about water soon. I've moved to Addison County, about an hour from Burlington, so I'll be blogging less about Burlington. 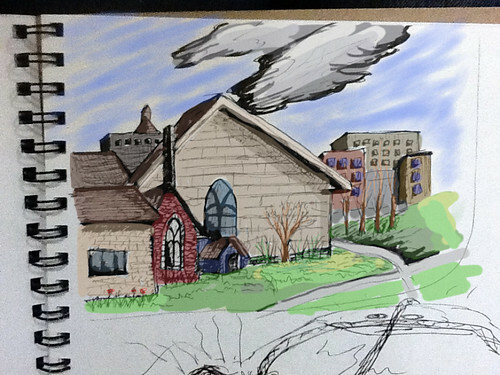 Meanwhile, here is a picture of Middlebury that I drew in a notebook then colored using an iPad. 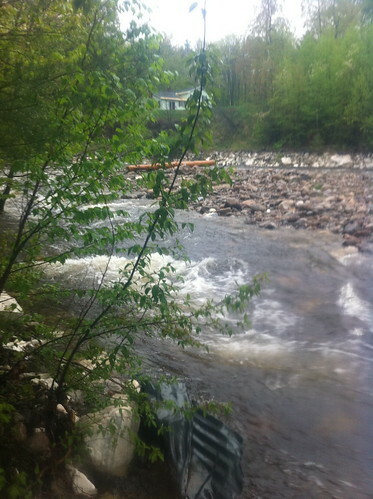 Yesterday, after 24 hours of steady rain, I went to check out the Middlebury River. The water had risen quite a bit... a branch of the river I had waded across the day before, to access a gravel bar island, was now about two feet deep and moving FAST. Note the log in the background, a foot or two above the water on a large gravel bar. Today there was quite a bit more rain - totaling 3.2 inches at my home in East Middlebury for the last two days, probably significantly more in the mountains. This afternoon, the river was raging! 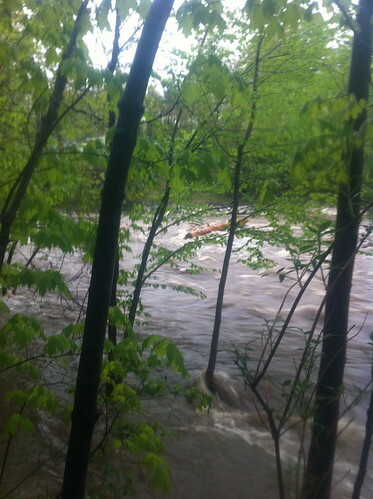 It had risen beyond the 'bankful' stage and was starting to flood through the trees. The log mentioned above had water splashing OVER it, and was starting to wiggle. I wouldn't be surprised if tomorrow it wasn't there anymore. So the Morganza Spillway is being opened, probably as I type. Much of the Mississippi is going to rush down the Atchafalaya River and the giant floodway around it. The delta will do as deltas do during floods - it is going to be flooded. It was not easy to make this decision, which will flood Morgan City as well as several other towns and many acres of agricultural lands. Not an easy decision... but considering the alternatives, the only one that could have reasonably been made. By not opening the spillway, the river might have put New Orleans under more water than Katrina, and inundated Baton Rouge as well. People in the area can describe the issues much more accurately than I, so see here for more info. Now it's time to wait, and watch, and hope the Old River Control Structure doesn't fail. If it does... we've got a whole lot of trouble coming. Lake Champlain has been dropping over the last week, though it is still above flood stage. It would be on pace to drop below flood stage in the next week or two. Unfortunately that probably won't happen yet, because a slow moving storm is forecast to sit over Vermont from tonight into next week, dropping several inches of rain. I wouldn't mind some scattered summer thunderstorms but unfortunately this is forecast to be cold early-spring rain. Unfortunately I'll probably have some flood pictures to share again next week. As for the Mississippi, the news has quieted down about it a bit, but the water is still slowly surging southward. I think the Old River Control Structure will survive this flood... but I doubt it will survive the next 20 years. We need to hope for the best, be grateful if we get it, and FIX THE PROBLEM rather than relying on hoping again. 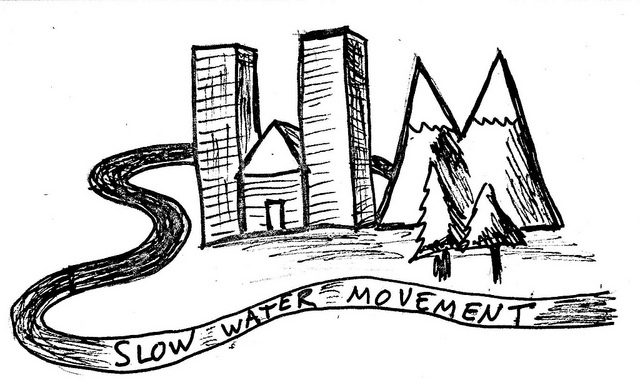 I recently set up a Twitter account at @SlowWaterMvmnt. I was originally very skeptical of Twitter but I am finding it an amazing way to share news and updates. I've been 'tweeting' about Vermont/Lake Champlain and the Mississippi River... am following some neat groups, and am trying to retweet relevant water-related and technology-related stories. If you're interested, try following me, and better yet, send me info about other relevant groups I should follow. Also, I am a Twitter newbie so if you have ideas on how to better manage the Twitter, let me know about that too. Floods are gathering a lot of attention right now, as they should be. But, the time to improve watershed health and reduce flood risk is not after the floods have started. When this one recedes, we need to make sure people are still aware of the many ways we need to improve our watersheds. The Mississippi River is experiencing a record flood. I was tempted to call it a raging flood, but in the flat Mississippi flood plain, there is no raging water to be had, unless a levee ruptures... otherwise just a slow, unstoppable advancing mass of water. In many places this flood is proving to be the 'worst' on record (although it is important to keep in mind that before people built levees there, vast areas were naturally flooded on a regular basis). The flood is bringing up squabbles over whether to open floodways, and whether areas should have been developed in the first place. There is even concern that the Mississippi will shift - that its lower stretches will divert into the Atchafalaya River and leave New Orleans and much of the lower Mississippi's previous course as a backwater. This weekend we had a bit of a break from the rain, which was well needed after last week. Here are some pictures from last week's storms. I will have pictures of high lake water soon, too. 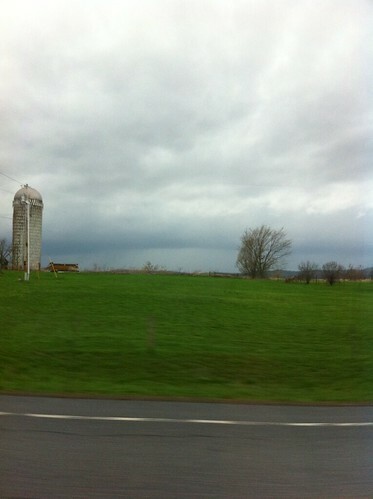 Squall line moving towards Virgennes, VT.